I’ll say in all honesty that I didn’t buy “21 Jump Street” for a second. The late-80s teen mystery TV show Johnny Depp starred in turned into a comedy? With Jonah Hill and the pouty dancer from “Step Up” as buddy cops undercover as high school students? It sounded like a throwaway that didn’t look a bit funny. Fortunately, the movie itself knew that not a lot of people would bet on it, so they mocked itself and other action clichés while stepping to its own silly beat. The result: a hilarious, freewheeling, and fresh comedy not seen in a long time. It showed viewers how good of a writer Jonah Hill is, how funny Channing Tatum can be when he embraces his inner idiot, and how far the anger of Ice Cube can go. It gave me great pleasure to tell others that this was a remake that actually worked, and now it gives me even more pleasure to report that Hill, along with returning directors Phil Lord and Christopher Miller, have delivered a comedy sequel that actually works. 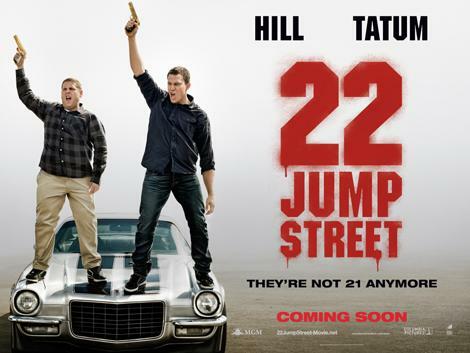 “22 Jump Street” follows undercover cops Schmidt (Hill, now with 2 Oscar nominations) and Jenko (Tatum, still with multiple abs) blowing another assignment. Therefore, their deputy chief (the always reliable Nick Offerman) passes them back to their now highly funded and upgraded Jump Street division, which no one saw to be successful at first and now, thanks to said success, has more money to spend (wink, wink). Jenko and Schmidt are assigned by their captain (Ice Cube, still angry and funny) to go undercover as college students to infiltrate a new drug being passed around campus. Schmidt is still an insecure nerd and Jenko is still a dumb jock, so Schmidt blends in with the art majors while Jenko becomes a football star. The main joke in “22 Jump Street” is the fact that this is a sequel, so the film acts like a sequel. Similar problems arise (Schmidt and Jenko get in too deep and have issues with each other), action scenes pop up here and there, and bromances blossom. What “22 Jump Street” executes is being so Meta about being a sequel that you’d think Abed from “Community” was behind the camera. There are subtle hints to “The Benny Hill Show,” along with the obligatory genital humor. There is a drug trip and the return of characters from the previous films, along with some great new supporting characters (specifically the droll but sharp Jillian Bell). The old parts are shined up and the new parts added on make the machine work all the more. Hill and Tatum are still fantastic as the physically mismatched but personally in-sync duo. Hill throws in more of a physical element to his work, whereas Tatum gets to burn his bro-tastic image more than ever. It really is satisfying to know Tatum can have fun with himself, and he bounces around like a kid on a sugar rush. Not every joke is a homerun, but it’s easy to smile or nod at the efforts the film makes to really knock this movie out of the park. “22 Jump Street” is funny, but not as funny as it wants to be. It’s more commendable for having the guts to both be an overblown sequel and step on the toes of other overblown sequels. It’s unclear if a trip to 23 Jump Street would be worth it, but take comfort in the fact that there is a comedy sequel that still wants to have fun instead of fill a quota (looking at you, Ron Burgundy). This entry was posted in Uncategorized and tagged 22 Jump Street, movie review. Bookmark the permalink.